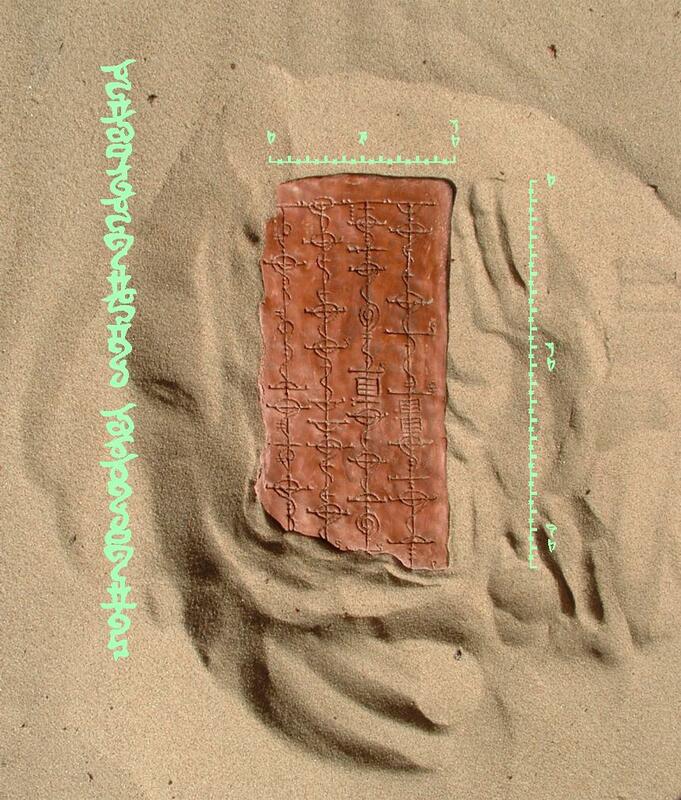 Image of the Varith Tablet during excavation. The electrical storm that recently ravaged the coast of Gol did more than damage the Engineering Quad on the T’Paal Campus of the Vulcan Science Academy and run the freighter Sadikh aground. When the dust settled, crews clearing coastal roadways of sand-drifts noticed what appeared to be the hull of a ship thrusting from the dunes. Authorities quickly verified that the shipwreck was not of the modern age, and the ruins were turned over to the Academy for study. 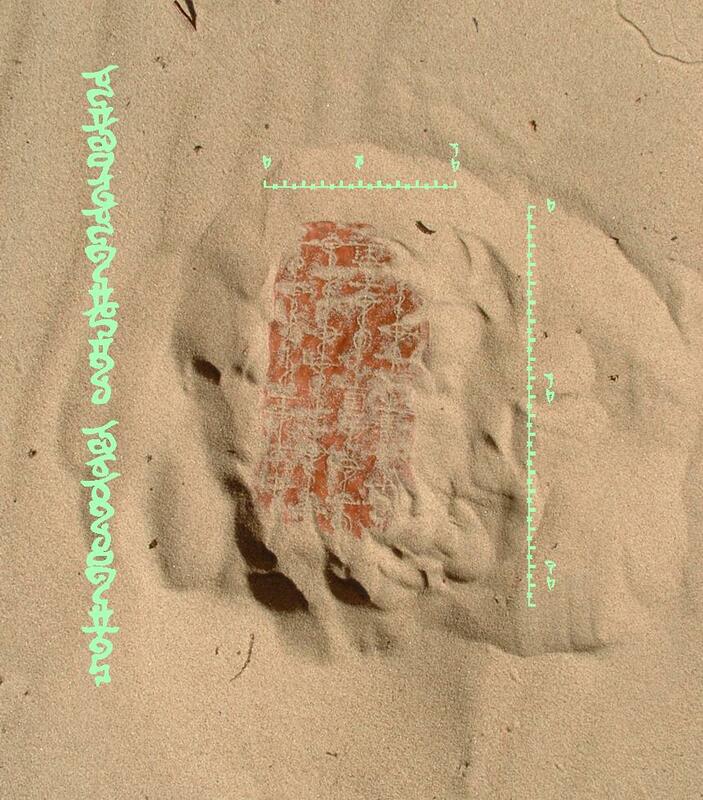 Although the excavation began only a month ago, of particular interest in this find so far is the oldest surviving sample of the Dzhaleyl script in what archaeologists have termed Kitau-Krizhiv t’Varith, or the Varith Tablet in Federation Standard English (FSE). As the excavation proceeds, there are likely to be other small windows into ancient Vulcan life. NOTE: The Vulcan font depicted in these images was created by Briht’uhn. For more information about the Zun font, please visit korsaya.org. This entry was posted in Archaeology, History, Language and tagged Dzhaleyl script, Star Trek, Vulcan language, Vulcan Science Academy. Bookmark the permalink. This is a very fascinating look into another culture’s life,in simple normal everyday things. Great work. I’m pleased you find it interesting. I wonder…what else do you suppose this excavation might turn up? Maybe a love letter, or a recipe, or graffiti left by an ancient person who wanted to leave his/it/her name. Talal ni maut-sem-rik heh taluhk.. Wa’ki’limatal donrumu t’nezhak na’Shi’Oren t’Ek’Tallar. Nam-tor vesht-var yut ik fulag-tor n’veh na’fa-wak. Dungi tu vuhrgwau k’etek bikuv heh ro’fori pa’spahk-neshuk-fek vuhlkansu fna’korsaya.org ha.